Number 4 of this article is really worth holding to. So what the heck are "tech resolutions"? Simple: They're tech-oriented habits, some that need adopting, some that need breaking. Most of them are pretty easy, too, at least compared with the likes of "no more pizza." Because, come on. Pizza! In no particular order, here are some tech resolutions worth following in 2019. How much time every day do you spend swiping away junk email? (Answer: Too much.) Let's make this the year you banish the junk altogether. One option: Every day, unsubscribe from five unwanted mailing lists. In any given email, look near the bottom for an "unsubscribe" link. If you're an iOS user, you can also look for an "unsubscribe" option at the top of the email -- though that merely shoots an unsubscribe request back to the sender, which doesn't always work. Yep, just five per day. Each one should take all of about 20 seconds, so you should be able to knock them out in under two minutes. After a few weeks of this, the flow of junk mail should have decreased significantly. Looking for something faster and more automated? Check out Unroll.me, a free service that will scan your inbox for subscriptions and let you ditch unwanted ones with a single click. It works with everything from AOL to Gmail to Yahoo and also has apps for Android and iOS. We all know how toxic the internet can be. The question is, are you part of the problem? I get the need to vent. I get how irritating it can be when someone ranks all the Marvel movies and totally gets it wrong. 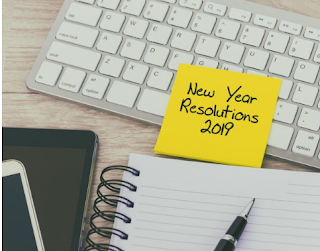 In 2019, resolve to just let that stuff go. No author, no video blogger and certainly no fellow commenter deserves to be called fat, crazy, stupid or worse just because you have a difference of opinion -- or even if he or she gets something wrong. If you must weigh in, think before you type. Think about the person at the other end. Think about the impact of spreading negativity. Ask yourself how you'd feel to be on the receiving end of what you just typed. and it's an eye opener. A sad, shameful eye opener. Don't be that guy. Don't be that person. Be nicer online because the world is hateful enough without you adding to it. I'm as bad as anyone: I use my phone when I'm standing in line, when I'm sitting on the throne, when I'm eating alone and, occasionally, when I'm eating with others. Pitiful. I just turned 50. I need time to slow the hell down, not continue to evaporate. So I'm going to work -- and it's going to be hard -- to use my phone less. To paraphrase folk-singer Stephen Stills: If you can't be with the phone you love, honey, love the phone you're with. Sobering fact: US traffic fatalities exceeded 37,000 in 2017 -- down from 2016, but still way too many. Texting while driving may not be the only reason, but it's definitely one reason. 6. Mount your phone on your dashboard. That'll at least keep it up near eye level, far better than glancing down at your cupholder, passenger seat or wherever you typically keep it. It'll also simplify screen-taps, even though you shouldn't be tapping while driving. Just saying. Check out these three ways to dashboard-mount your phone. Enable "car mode." Your phone is smart enough to automatically detect when you're driving and automatically respond accordingly to incoming text messages. That leaves you free to focus on the road. Android users, here's how to use Android Auto. iPhone owners, learn how to enable Do Not Disturb While Driving. This one's easy: Every time you print a noncritical document, print it "two-up," meaning two pages shrunk down to fit on a single page (book-style). Look for this setting in the print dialog. Finally, ask yourself if you really need a hard copy at all. The best way to save paper is to "print" your documents as PDF files, which you can then store electronically. This capability is built into most software; just select "save as PDF" as your preferred printer. OK, those are my tech resolutions! Now let's hear yours. Tell me how you're going to leverage tech for a better 2019. I would love to hear from you.